Rick Bartow (1946-2016) is one of Oregon’s most celebrated Indigenous artists. His work gained national recognition during his lifetime: For instance, his monumental cedar carvings We Were Always Here went on permanent display in 2012 outside the Smithsonian National Museum of the American Indian overlooking the National Mall. 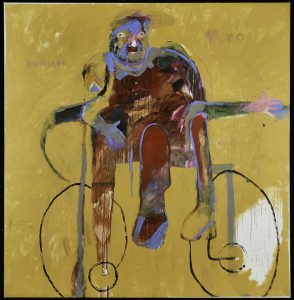 The Museum exhibition opening January 26, Rick Bartow: Things You Know But Cannot Explain, celebrates and memorializes Rick’s extraordinary life. The exhibit’s time at the High Desert Museum marks its last Oregon appearance, and it will include a rarely seen painting by Rick from the Museum’s permanent collection. Rick was many things: a Native American, a decorated Vietnam veteran, a contemporary artist and an intellectual. He was born and raised in Newport, Oregon. He was a member of the Mad River Band of the Wiyot Indians and had close ties to the nearby Siletz Reservation. After studying art for a time at what is now Western Oregon University, he was drafted into the Army and served in Vietnam. The trauma he experienced there left him with post-traumatic stress disorder and caused him to struggle with alcoholism for most of the 1970s. He found his way out of those dark years by reconnecting with Indigenous tradition, immersing himself in the beauty of nature and embracing the therapeutic and redemptive power of art. Rick once described this process by saying, “I drew myself straight.” His work is raw and powerful, and it exhibits a hard-won sense of optimism. Rick’s sculptures, paintings, drawings and prints are an eloquent exploration of his identity, and they remind us that identity is layered and complex. The art is an insightful expression of life as a struggle. Paint drips and gestural marks coexist with carefully rendered forms to create compositions that are as dynamic and beautiful as they are meaningful. Rick made art that is vibrant, physical and engaging. He effortlessly combined images of shamans, totems, talismans, masks and creation stories with ideas from Western philosophy. This diversity of subjects reveals Rick to be a person who deeply valued tradition but was also a voracious reader, a deep thinker and an amateur naturalist. He had an all-consuming passion for the physical world in all its messy and contradictory glory. Rick’s work reminds us that art is a powerful form of expression that transcends words and defies stereotypes. Support for the exhibition is provided by the Ford Family Foundation, the Oregon Community Foundation, Arlene Schnitzer, the Coeta and Donald Barker Changing Exhibitions Endowment, The Harold and Arlene Schnitzer CARE Foundation, a grant from the Oregon Arts Commission and the National Endowment for the Arts, a federal agency, the Ballinger Endowment, Philip and Sandra Piele, and JSMA members.